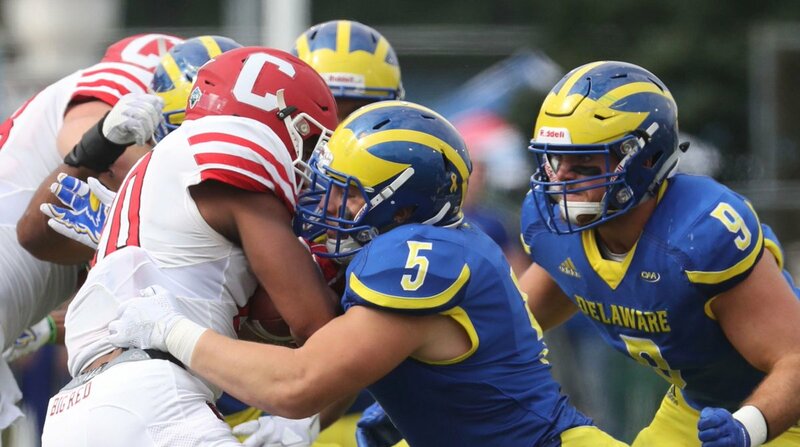 Delaware’s defense limited Cornell to 232 yards of offense and improved to 2-1 on the season with a 27-10 win on Saturday afternoon at Delaware Stadium. The loss ruined the Big Red’s 2018 season opener. Junior quarterback Mike Catanese connected with classmate Davy Lizana in the right corner of the end zone in the game’s final minute after Nickolas Null opened the scoring with a field goal in the first quarter, but in between the Blue Hens stifled the Big Red offense and was opportunistic against its defense. Blue Hen quarterback Pat Kehoe was just 14-of-29 passing, but was credited with 254 yards. His favorite target, Joe Walker, hauled in six passes for 154 yards, making him the first Delaware player in school history to register games of 100 yards rushing and receiving and 200 yards passing in a career.